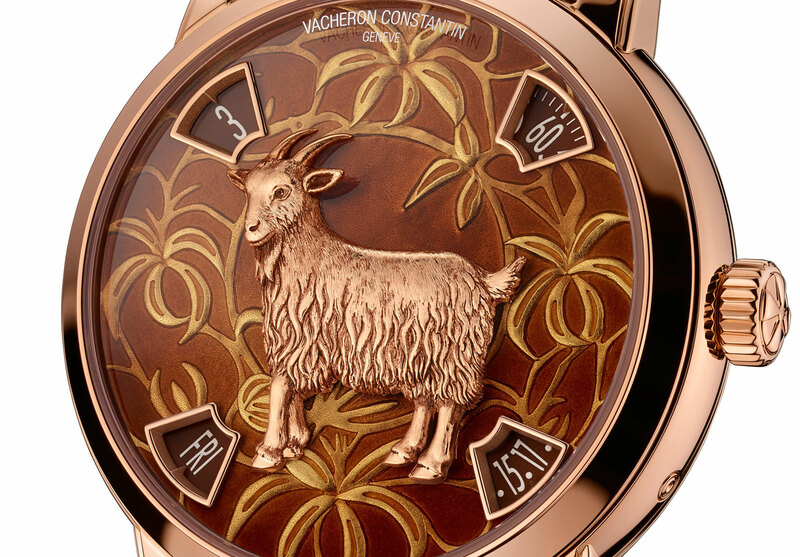 Next month at SIHH Vacheron Constantin will officially unveil the Métiers d’Art The Legend of the Chinese Zodiac dedicated to the Year Of The Goat in 2015. With a hand-enamelled and engraved dial, the timepiece features window displays for the time and calendar. 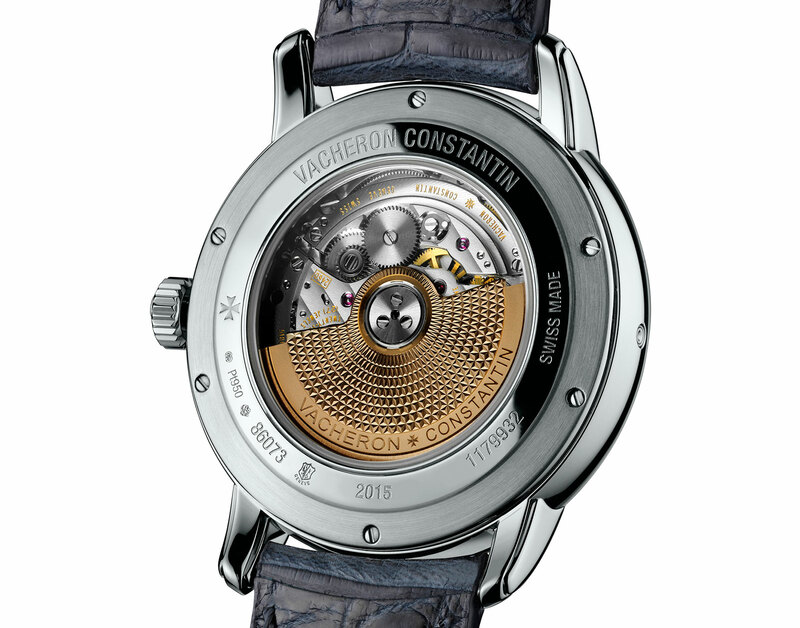 Each year Vacheron Constantin creates a limited edition to commemorate the year’s animal of the Chinese Zodiac – 2015 is the Year of the Goat. The Métiers d’Art Year Of The Goat is powered by the calibre 2460 G4, a self-winding movement that displays the time and calendar on four windows on the edge of the dial, creating a canvas for elaborate dial decor in enamel and engraving. Made from a disc of 18k gold, the dial is first engraved with a leaf pattern, then covered with several ayers translucent blue or bronze enamel (the dial colour depends on the case metal), painstaking fired with each successive layer. 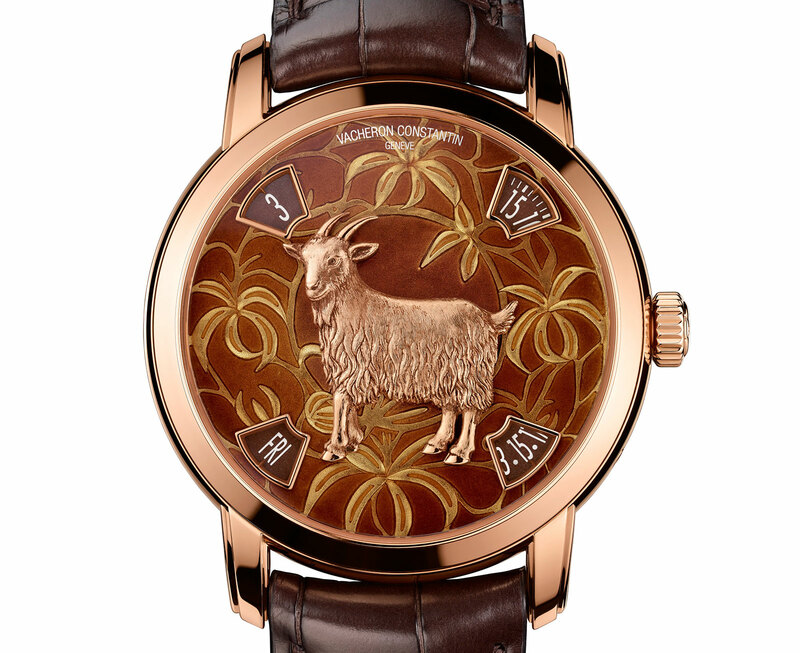 At the centre of the dial is a goat, made of solid gold or platinum to match the case. The goat is hand-engraved, right down to its fine fleece. Developed in-house as Vacheron Constantin’s top of the line automatic movement, the calibre 2460 G4 inside is self-winding, with all indications show in windows. The hours and minutes are at 11 and one o’clock respectively, while the windows at the base of the dial show the day and date. Both the hour and minute displays are of the dragging type, with the discs constantly moving. In contrast the day and month discs are instantaneously, jumping at midnight. Like all of the brand’s mechanical movements the 2460 G4 has the Geneva Seal. 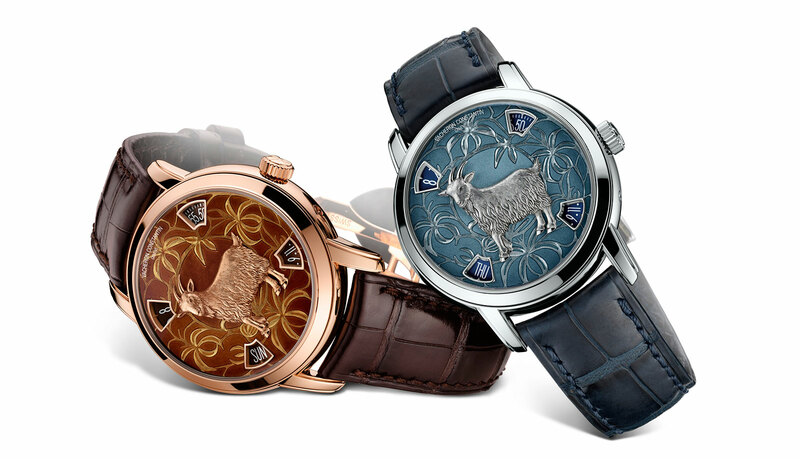 The Year Of The Goat is limited to 12 pieces each in platinum and rose gold, and priced at €104,100 and €85,700 respectively.